Choosing a name for my new yoga teaching business is not something that came easily to me. Teaching yoga and branding yourself are two very different things. I love teaching yoga but I’m not a marketing whiz, I’m also quite modest, so the idea of selling my services was and continues to be very uncomfortable. When I returned from my training in Bali, though, the name Star Lotus came to me. For as long as I can remember, I have been fascinated by the stars and the vastness of the universe. I’m convinced that in another life I was an astrophysicist. When I look up into the sky on a dark, clear night I can’t help but feel incredibly small. But in the best way possible. When I see the vastness of the universe expanding before me, when I see how small I am in my place in the universe, it makes my worries seem small. In contrast, my gratitude expands as vast as the universe. When I am under the stars, I realize that we are all one, that we are especially blessed to be exactly where we are in this cosmic space with the awareness that we have been gifted. Under the stars, I am reminded of the love that is all around me. The stars remind me of my connection to the power that is both beyond myself as well as within. The lotus blossom on my final day of teacher training. The lotus flower is a very beautiful flower that grows in muddy waters and holds deep spiritual symbolism. Beginning from the seed buried in the mud, the perfectly clean bud that emerges from the dark murky water finally blossoms and opens its petals to the sunlight. The lotus flower symbolizes the process of spiritual growth to enlightenment. As the lotus petals expand and open to the sun they symbolize, also, the expansion of the soul. The lotus represents creation, cosmic renewal, purity, and detachment. There is a mantra dedicated to the lotus: Om mani padme hum. There are many meanings to this Sanskrit mantra, literally it means jewel in the lotus. It is a mantra of compassion and love that reminds us that we are all one and we are all connected to the divine consciousness. 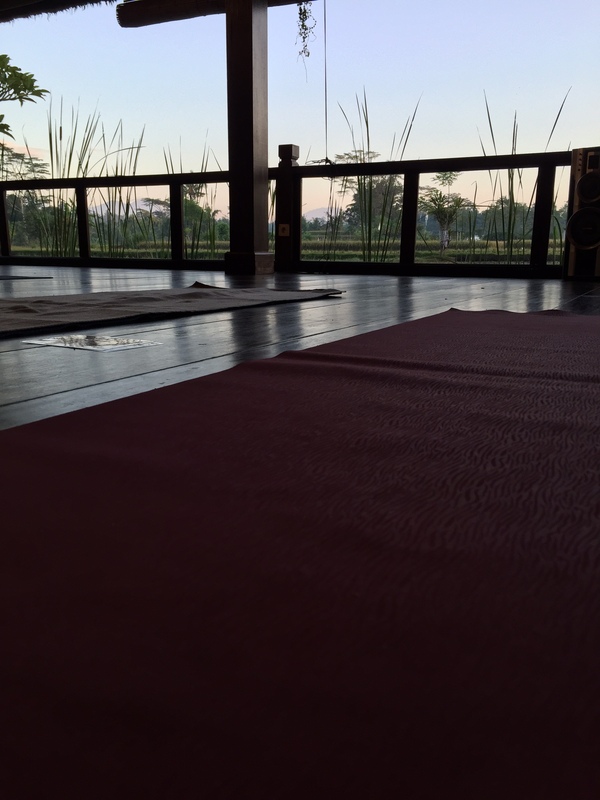 During my Yoga Pranala teacher training in Bali, we were lucky to be able to practice in a beautiful open-air shala surrounded by rice fields. Every morning we would arrive at 6:30 in the morning to start our practice and our day. We would practice and watch the sunrise and the rice farmers as they would let the ducks out and start their day tending the fields. Water lilies, reeds, and lotus plants grew in the little ponds surrounding the shala. My training lasted 23 days and on the first day I noticed a tight lotus bud had emerged right at the front of the shala. I kept my eyes on it as the days went by to witness the blossoming of the beautiful pink flower. It was the first of many buds to blossom during those 23 days. The lotus flower reminds me of the perfect timing of the universe and to have faith in that timing. 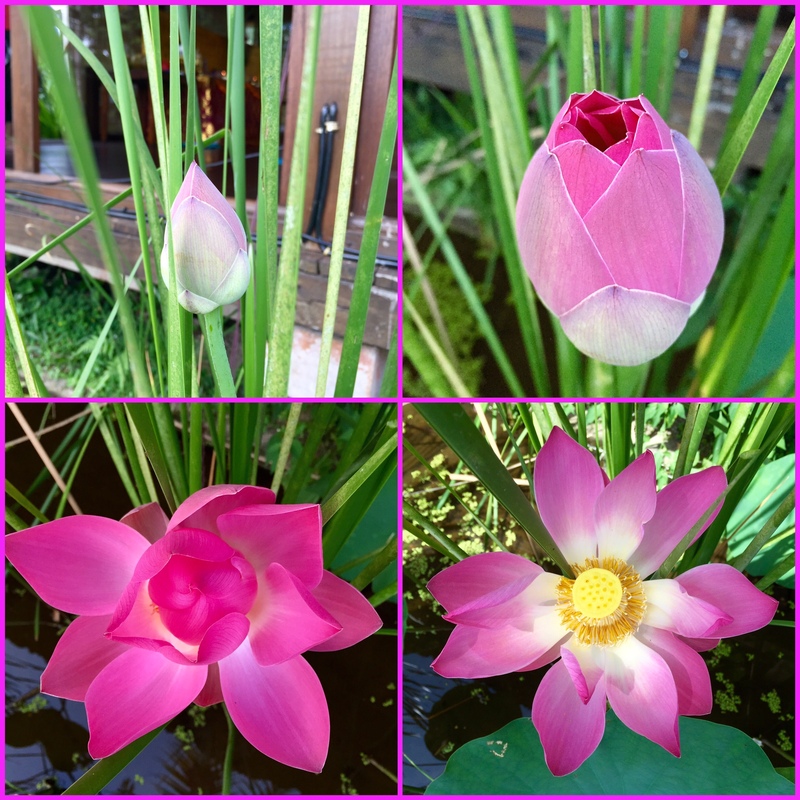 Lotus buds would bloom on very auspicious days during my time in Bali. On the 16th day, the day of my teaching practicum where I was the first of my class to teach my 12 other teacher trainees, a lotus blossomed. 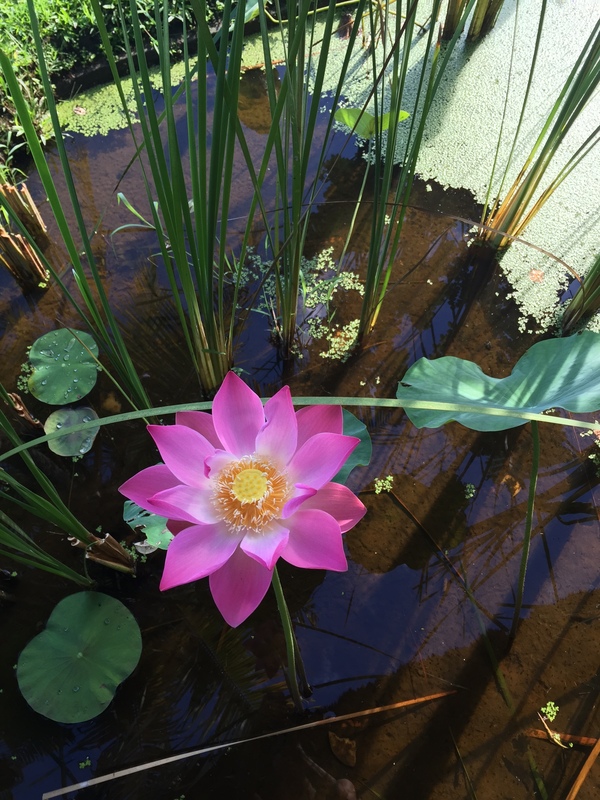 And on the final day of my 23 days of teacher training, another lotus bud went into full bloom. It was the most beautiful and perfect of the lotus flowers that I saw bloom, I’m using the picture of that lotus as my website banner. The lotus blossoms were signs from the universe that everything is in perfect order and that we must have faith. Star Lotus Yoga. A name which invokes my time in Bali, the love of my yogi sisters, and the wisdom of my teachers. A name which reminds me of gratitude, love, compassion, growth, and faith. The blooming lotus from day 16 of my teacher training.